Gary McHale and wife, Christine were formally recognized by Blatchford in the Acknowledgements section for their contributions to the book which includes a credit for supplying the cover photo. 1. Provide links to documentation in context of the book so readers can have access to the mountain of evidence that shaped it. 2. Carry news and reviews about the book. 3. Promote the book to the best of our ability with the coincidental hope that HELPLESS will be the catalyst to at long last expose the vital issues raised by ‘Caledonia’s Nightmare of Fear and Anarchy’ to rigorous academic scrutiny, and move them onto the policy development table. 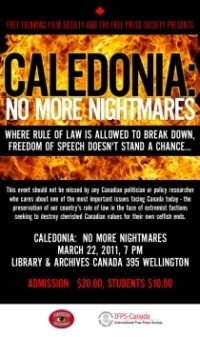 We hope this will lead to legislative changes and dialogue that will not only ensure there are no more Caledonias, but enable the healing process between Caledonia, the OPP and Six Nations to finally begin in an fresh environment of the reality, honesty and mutual respect that has, sadly, been in short supply to-date. 4. Provide education to Canadians with respect to the meaning of the ‘rule of law’ and its critical importance in maintaining our country as a peaceful refuge with strong civil liberties for all.